The orchestrator—used alongside other PE tools, such as Code Manager—allows you to control when and how infrastructure changes are made before they reach your production environment. 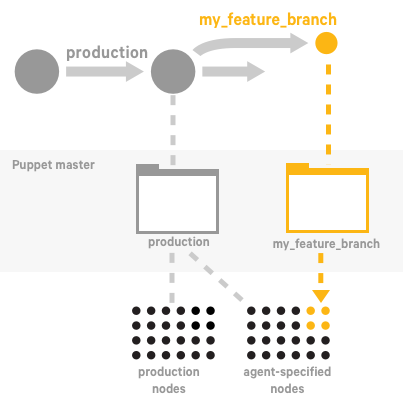 The Direct Puppet workflow gives you precise control over rolling out changes, from updating data and classifying nodes, to deploying new Puppet code. In this workflow, you configure your agents to use cached catalogs during scheduled runs, and you send new catalogs only when you're ready, via orchestrator jobs. Scheduled runs continue to enforce the desired state of the last orchestration job until you send another new catalog. In this workflow, you set a up a node group for testing and validating code on a feature branch before you merge and promote it into your production environment. To use this workflow, you must enable cached catalogs for use with the orchestrator so that they enforce cached catalogs by default and compile new catalogs only when instructed to by orchestrator jobs. This workflow also assumes you’re familiar with Code Manager. It involves making changes to your control repo—adding or updating modules, editing manifests, or changing your Hiera data. You’ll also run deploy actions from the Code Manager command line tool and the orchestrator, so ensure you have access to a host with PE client tools installed. 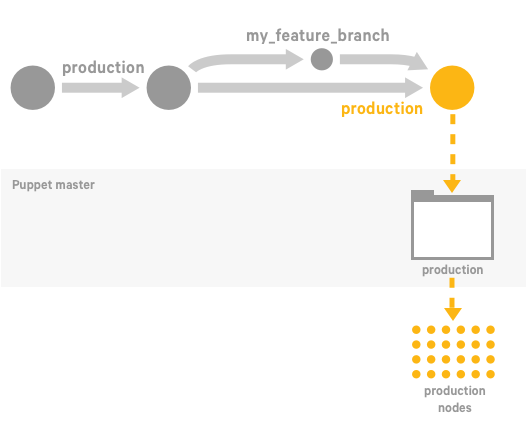 The first step in the Direct Puppet workflow is to set up node groups for testing your new feature or code. If they don't already exist, create environment node groups for branch testing, for example, you might create Development environment and Test environment node groups. Within each of these environment node groups, create a child node group to enable on-demand testing of changes deployed in Git feature branch Puppet environments. You now have at three levels of environment node groups: 1) the top-level parent environment node group, 2) node groups that represent your actual environments, and 3) node groups specific to feature testing. This rule matches any nodes from the parent group that have the agent_specified_environment fact set. By matching nodes to this group, you give the nodes permission to override the server-specified environment and use their agent-specified environment instead. After you've set up a node group, create a new branch of your control repository on which you can make changes to your feature code. Branch your control repository, and name the new branch, for example, my_feature_branch. Make changes to the code on your feature branch. Commit and push the changes to the my_feature_branch. Now that you've made some changes to the code on your feature branch, you're ready to use Code Manager to push those to the Puppet master. Note: After this code deployment, there is a short delay while Puppet Server loads the new code. Tip: You can also use the console to create a job targeted at a list of nodes in the my_feature_branch environment. Validate your testing changes. Open the links in the orchestrator command output, or use the Job ID linked on the Job list page, to review the node run reports in the console. Ensure the changes have the effect you intend. If everything works as expected on the development nodes, and you're ready to promote your changes into production. 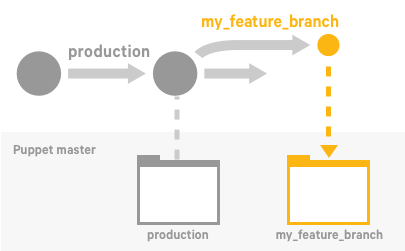 Merge my_feature_branch into the production branch in your control repo. Before running Puppet across the production environment, preview the job with the puppet job plan command. If you're satisfied with the changes in the preview, you're ready to enforce changes to the production environment. Tip: You can also use the console to create a job targeted at this PQL query. Finally, you're ready to validate your production changes. Check the node run reports in the console to confirm that the changes were applied as intended. If so, you're done! Repeat this process as you develop and promote your code.